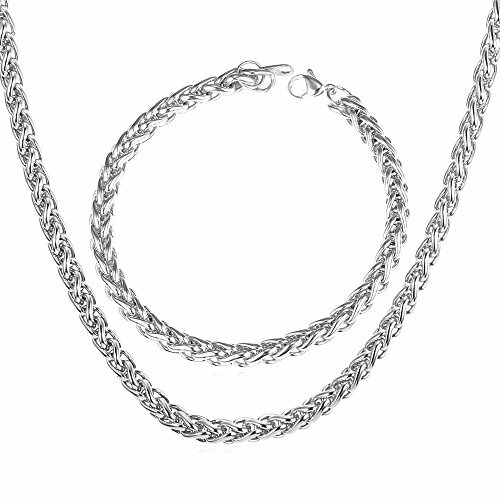 Rope chain:6mm Metal: stainless steel Color: stainless Bracelet length:8.3 inches Necklace length options:18",22",26",28",30" Style:trendy/cool Gender: men,women,teens,boys,girls. 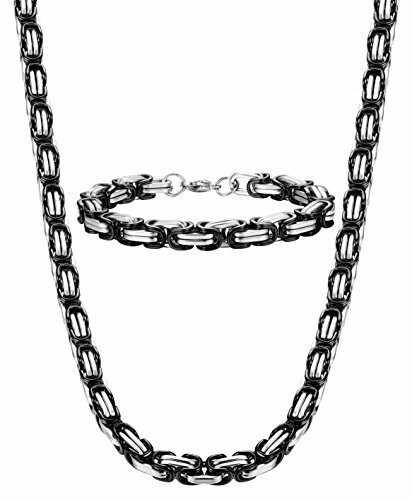 For more chains, please visit U7 Jewelry storefront and search chain. Brand name: U7 "U7" means love you seven days for a week. U7 Jewelry is fashion jewelry seller in Amazon. U7 Jewelry is made with German imported polishing and electroplating equipment. Package content: 1 bracelet,1 necklace,1 black velvet pounch, Gift box, paper card. Jstyle Jewelry: Your Reliable Choice of Fashion Jewelry High average review rating of jewelry collection. All handmade jewelry, well polished and one by one quality controlled. Affordable prices and luxury appearance. 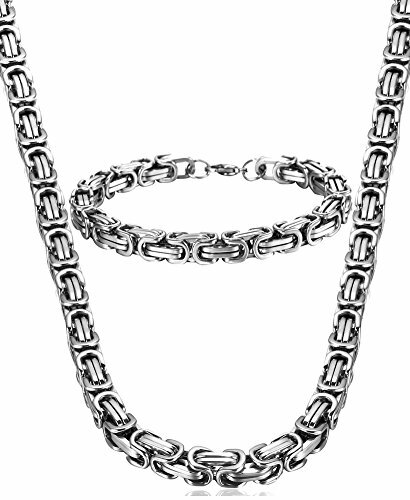 Jstyle Stainless Steel Male Chain Necklace Mens Bracelet Jewelry Set,8mm Wide Comfortable and Firmly Chain for Men! Why choose stainless steel for jewelry High quality stainless steel is highly resisted to rust, corrosion and tarnishing. As one of the strongest of all jewelry metals, it does not oxidize and will be very durable. 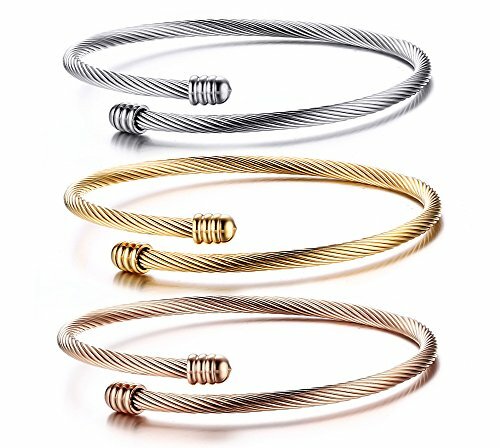 All make it a top fashion accessory to complement your wardrobe with the sleek, contermporary styling offered by our stainless steel jewelry. Besides this, you can wear stainless steel jewelry when swimming, taking shower, washing and working etc. It will not change color or break. 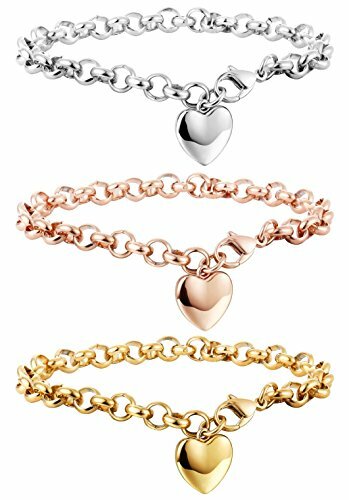 Size 8mm wide,8.5 in of bracelet,22/24/30 in of necklace Long time Warranty At Jstyle Jewelry, we believe in our products. That's why we back them all with an 90-day warranty and provide friendly, easy-to-reach support. Jstyle Jewelry: Your Reliable Choice of Fashion Jewelry. We are Engaged in Giving you the Best Shopping Experience. High average review rating of jewelry collection. You can truely trust our products and service. All handmade jewelry, well polished and one by one quality controlled, Seriously inspected under 3-level QCS. Affordable prices and luxury appearance.We provide them in a high Cost Performance. Fashion is not eaqual to expensive cost. 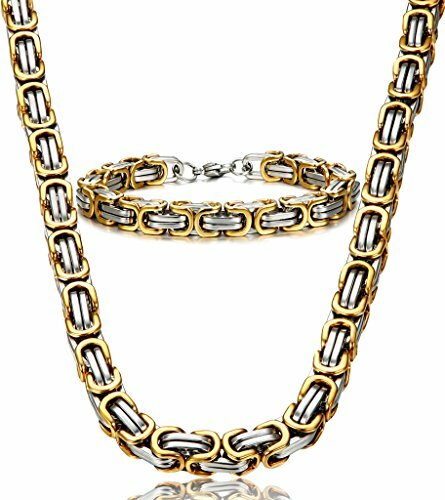 Jstyle Stainless Steel Male Chain Necklace Byzantine Bracelet for Men Jewelry Sets 8.5 Inch 22 24 Inch Well-polished technology, with sparkling smooth surface and perfect texture, better enjoyment of vision. 3-level QCS insures quality and the detailed workmanship, with perfect cool appearance. High Quality Material----Care for Your Health. Made of stainless steel which guarantees high strength and hardness. We are always managing to provide the best, not only top pattern and quality but also our after-sale service. Long time Warranty At Jstyle Jewelry, we believe in our products. That's why we back them all with an 90-day warranty and provide friendly, easy-to-reach support. Jstyle Jewelry: Your Reliable Choice of Fashion Jewelry High average review rating of jewelry collection. All handmade jewelry, well polished and one by one quality controlled. Affordable prices and luxury appearance. 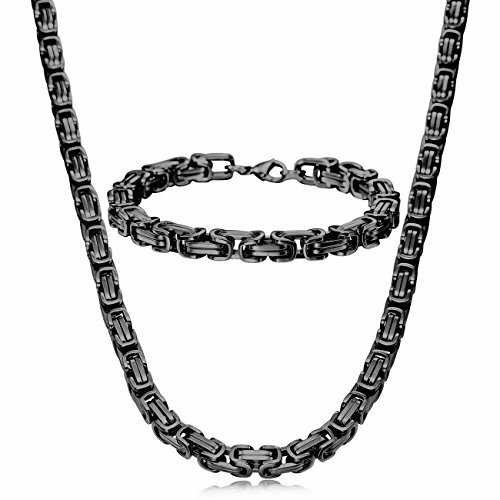 Jstyle 8mm Stainless Steel Mens Necklace Bracelet Set Byzantine Chain Black 22-30 inch Comfortable and Firmly Chain for Men! Why choose stainless steel for jewelry High quality stainless steel is highly resisted to rust, corrosion and tarnishing.As one of the strongest of all jewelry metals, it does not oxidize and will be very durable. 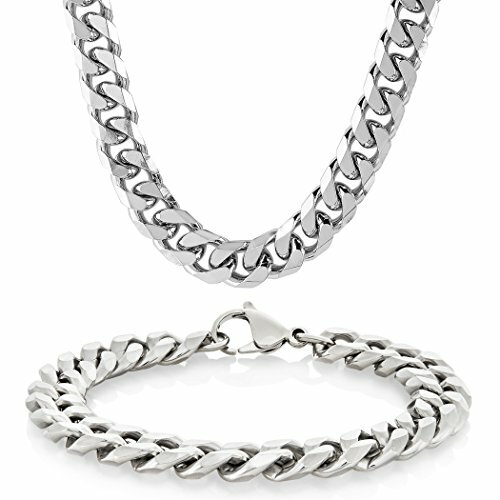 All make it a top fashion accessory to complement your wardrobe with the sleek, contermporary styling offered by our stainless steel jewelry. Besides this, you can wear stainless steel jewelry when swimming, taking shower, washing and working etc. It will not change color or break. 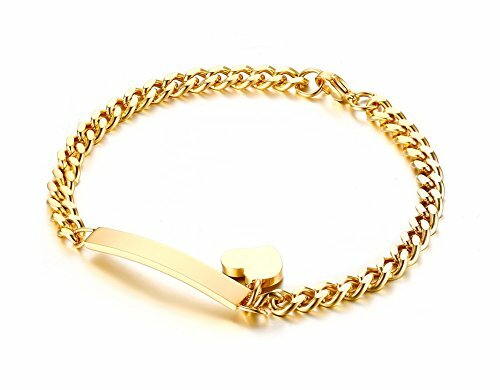 Size 8mm wide,8.5 in of bracelet,22-30 in of necklace Long time Warranty At Jstyle Jewelry, we believe in our products. That's why we back them all with an 90-day warranty and provide friendly, easy-to-reach support. 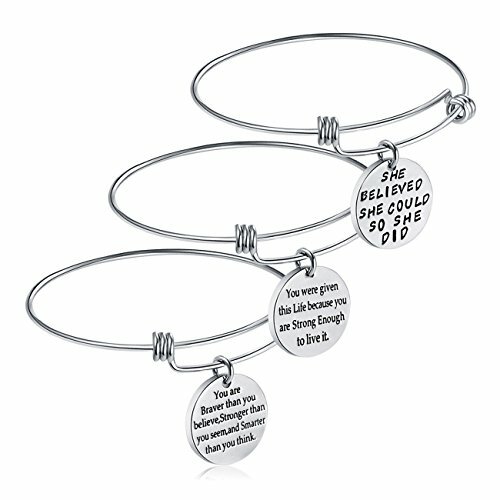 Copyright © Wholesalion.com 2019 - The Best Prices On Set Stainless Steel Bracelet Online.